I keep a used vacuum motor on my desk at work. It came out of an amazing and feature-packed appliance that I ripped apart. I have it there as a reminder that no amount of beauty or cool features on the surface of something can eliminate the problems caused by a poorly designed core. One of the things I really appreciate about working with Murphy Building is their attention to detail and quality. As mentioned previously, if you want a truly sound-proof wall, these guys will jump over the moon to deliver it. Even if you don’t need super sound-proof walls, what do want is quiet floors that are squeak free. The dry hot days and cool damp nights of this past summer really put the frame and subfloors through their paces. By the time the roof was up, a couple of floor squeaks had developed despite the long nails and construction glue holding the subfloors to the joists below. Of course, this was all to be expected. 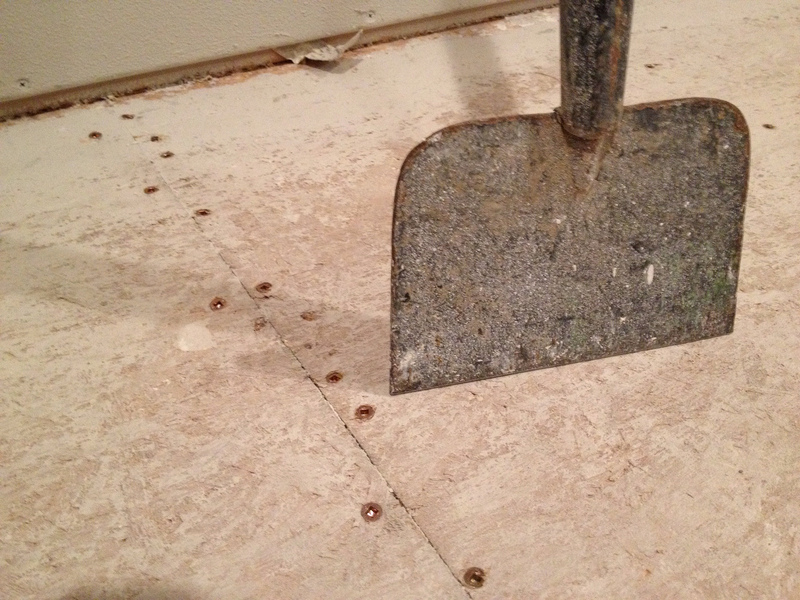 As part of their standard building process, Terry Murphy reinforces all of the nailed down subfloors with screws. Unlike the subfloor nails, screws won’t back out and loosen up as easily over time. The two mechanical fastener types working together form a squeak-resistant system that will have you stealthily sneaking into your kitchen for cookies as long as you live there. I’ve never lived in a home that didn’t have extremely squeaky floors. Growing up, I developed a mental squeak map of our house so that I could sneak into the kitchen (mostly) unnoticed at night. I’m looking forward to giving up the squeaky floor lifestyle. If ever I feel like there isn’t enough ambient noise, I’ll just turn on the guest bathroom fan. Another important step to ensure an easy flooring install and a longer service life is to scrape the subfloors. During the construction process, the wood gets dinged, nails and screws poke up, and drywall mud gets stuck everywhere. While Terry secured the subfloors with screws, Bob worked hard with the scraper and vacuum to ensure that every square inch was fit to lay down hardwoods you could bowl on. This scraping action is hard work. Imagine having to ensure some 2700 square feet were smooth and clear of debris before the hardwood and carpet guys came through. It’s one of those unenviable yet very important tasks that often goes unappreciated. A critical piece that is often overlooked is the support behind surface components that anchor into the wall. Handrails, art areas, coat rail, book shelves, and thermostats are all ideal places to have a piece of wood backing up the drywall. With backing, your anchor screws are guaranteed to hit something structural and you won’t have worn out drywall holes requiring a patch or large anchors. 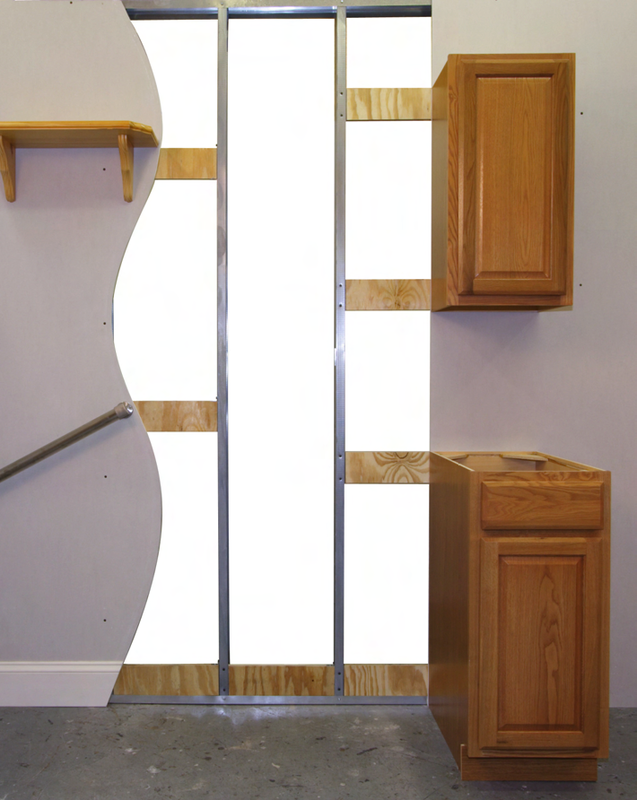 For things like handrails and closets, having a structural backing is not just a practical matter, it can be life-or-death safety. Sometimes anchoring to the studs isn’t an option and it doesn’t take very many pounds of force to break an anchored screw out of drywall. You might be surprised just how much force a 180 lb person exerts on a handrail as they trip going up stairs. If you have kids, you can guarantee that at one point, they will climb either a bookshelf or a dresser. Would you trust a one or two screws straight into drywall to keep the heavy case from tipping? Experience is undeniably beneficial. An experienced architect will use her experience to tweak a design for a particular regulatory area, climate, lifestyle, and location. Likewise, an experienced builder will know the benefits of building a house a foot higher to ensure a reliable sewer or protecting new hardwoods with matting while finish work is being completed. If you haven’t picked a builder yet, it is important to consider their areas of experience. We briefly toyed with the idea of hiring Murphy to build a completely modern style home. In the end, we decided we were more comfortable with the process of homebuilding with traditional styles and materials. Murphy isn’t styled as a modern homebuilder either, so I expected they were most comfortable building a traditional home as well. Since we based our house on a design Murphy had just built, we benefitted from considerable experience with this particular design. For example: our house has a more efficient placement for the attic access hatch which makes more room for a light in that particular closet. The cold air return is in a more efficient and less obvious location. The notch in the foundation wall where the hot furnace air duct passes is considerably larger, making for easier airflow and a better furnace fit. We also benefitted from the experience of a family who bought one of the previous homes. Based in part on their advice and critiques, we added several windows and lights. Make sure your builder has experience in the style of home you are building. If you found your architect first, ask them for references to builders who have built their houses before. Attempt to meet and ask questions of homeowners of houses built by your builder or designed by your architect. Ask them what they would have done differently or what they ended up changing after the fact. The electric motor pictured above came from a Dirt Devil 082700 Vision Turbo. It had everything I wanted: It was powerful, quiet, bagless, and had an analog speed control right on the hand wand. When it stopped producing enough power to clean, I was perplexed. The warranty had just expired and it had seen relatively little use. I decided to dismantle it and locate the problem. What I found left me very disappointed. The air flow through the canister vacuum went from the head, through the hose, into the filter chamber, into the motor fan, straight through the windings, and out the HEPA filter. The critical error here is that the air, still laden with micro-particles, passes right through the very guts of the motor. While it is important to keep air flow over an electric motor in order to keep it cool, this approach was either extremely lazy or designed to fail and need replacement. Gunk gets into the bearings, windings, and brushes, drastically reducing the motor’s performance. I keep it on my desk at work because it helps remind me to stay focused on building a quality product throughout. Find yourself a good builder and they will do the same thing for you. This entry was posted in Construction and tagged architecture, builder, cabinets, design, drywall, floorplan, foundation, hvac, planning, problems, spec. Bookmark the permalink. I tend to be a perfectionist and expect the same from my contractors and I know enough about building a house to know when it’s right and certainly when it’s wrong. It’s a practice in patience when I find a mistake that they should have caught.